Regular readers of JibberJabberUK will know how important photographs are to me. Each week I share a Sunday Snap from our travels around the country. Rarely a day goes by without me taking a photograph of something. Of course one of the problems of being able to take so many photographs is that they stay on your phone whether in cloud storage, on a blog or on your social media accounts. The last time I looked I had over 23,000 photographs on Google Photos alone! 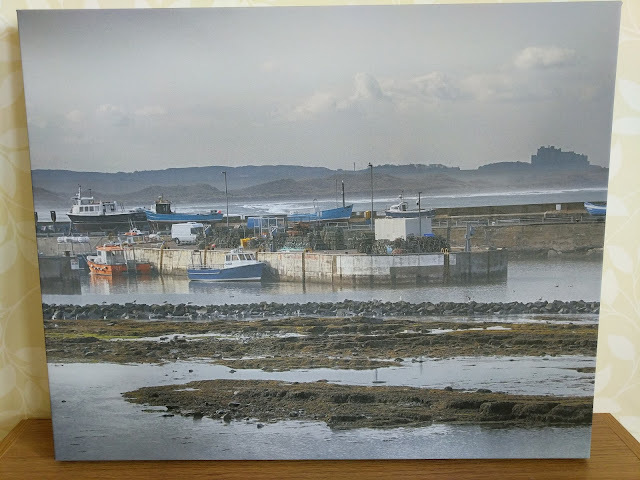 When I was approached by TescoPhoto.com to try their same day canvas printing I knew this was going to be a great opportunity to finally get an image off my phone and into print. My only problem was going to be deciding what to turn into a canvas. We have a range of prints around our bedroom of coastal scenes we have visited. It wasn't something we originally planned but it has just developed over the years. For our canvas we chose a shot of Seahouses Harbour with Bamburgh Castle in the background. It was taken in the afternoon but the mist hadn't lifted all day. The stillness of the water in the harbour contrasts with the waves crashing in on the beach behind. Since I took this photograph on my Canon DSLR with 20.2MP I wasn't worried about quality being affected by blowing the image up so large. The order process was really simple. The only problem I had was deciding on what size I wanted! I would recommend getting out a tape measure and properly sizing up the wall size you want to hang your canvas in. In the end I went for a 20”x16” canvas which costs £52. I checked beforehand that my local Tesco Extra did the same day service and then went ahead with the order. I just uploaded the image from my laptop and the image was displayed on the screen how the canvas would be created. The ordering details state that if you order before noon it will be ready to collect after 3pm. I placed by order at around 10.40am and within the hour I had an email telling me my order was ready to collect! When I went to pick it up later that day it was packaged up in bubblewrap ready and waiting for me. I am someone who is quite critical of customer service but I was very impressed by this. Home it came and went straight up on my wall. I ordered a canvas for review purposes. All words, photos and views are my own. What was the price like?